Blogs | Wikis | Docs | Special Apps | Note-taking | Concept Maps |Biographies & Interviews | R.A.F.T. Mind mapping is a technique of note taking using colors, shapes, patterns, keywords and images so that the information is rendered holistically. Mind mapping uses the whole power of the brain and uses both sides of the brain to study subjects usually only studied with left brain. Provide students with nonlinear visual ways to understand, produce, and represent knowledge. Help develop higher-order thinking skills including analytical skills. Facilitate the recall and processing of information. Help students externalize their knowledge and show their understanding. Make explicit structural forms of knowledge and relationships between concepts and therefore enhance students comprehension. They attend to different learning styles. They engage students in meaningful learning activities. They are effective organizational tools students can use to organize their knowledge. Visual representations of knowledge is proved to both stimulate and increase brain activity (Marzono, 1998, cited in Birbili, 2006). Boost social interaction, communication and collaborative team work. They can be used in different content areas and with students from different grades. Below are online graphic organizer programs, downloadable templates, notetaking tools, and visual thinking tools. Even if your school has Inspiration these tools enable students to use free graphic organizers outside the classroom. Gliffy Similar interface for those who are familiar with Visio. Nice variety of text box shapes. 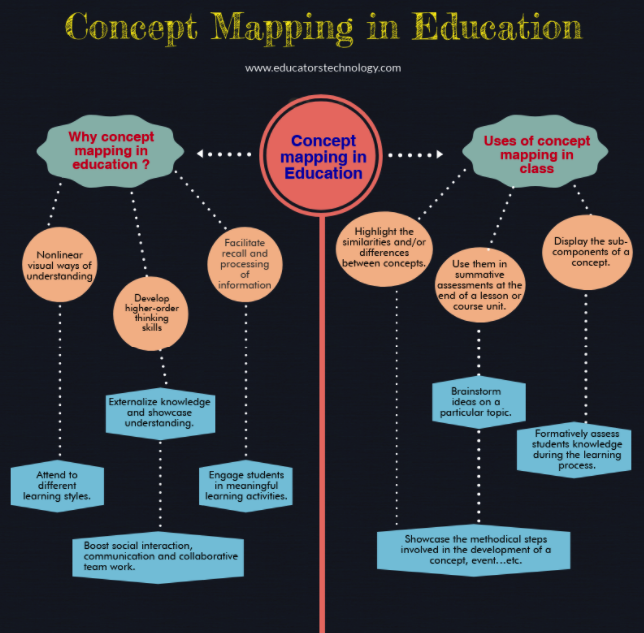 You can share your concept maps with others online. Text boxes on links are not automatic, so you have to place a regular shape on a link. The premium version has a fee. Mindomo - also let's you collaborate, comment, multimedia, text on links and add audio. Exploratree - A great visual site for creating a mind map with numerous of templates for different applications like opinions and cause and effect and more. Class Tools Hexagons Generator lets you create an online hexagonal learning activity to share with your students. To use the template just enter a topic then a minimum of five terms related to that topic. Write some text in the text area, use the TAB key to indent text lines, and click the "Draw Mind Map"-button to see what happens. Each text line in the text area will become a separate node in the mind map. Indenting the text (using the TAB key) starts a new branch of nodes in the mind map. Also, have a look at the Options to style your mind map. Take the tour to see the possibilities. Web-based interactive drawing features. Good example of the interative potential of the Web. Essay Map, as its name indicates, is a tool that helps students with their essay writings. It is an interactive graphic organizer that provides students with a step by step guidance through the process of developing a robust outline to their essays. ProcessOn designed for creating collaborative diagrams. ProcessOn is very user friendly and allows users to add: shapes, bubbles, text, images, colors, etc. Best of all ProcessOn is collaborative in nature and ideal for student's working in groups on the same project. The social networking features allows users to share, collaborate, chat, and set privacy features all in real-time which is ideal for education. Not only is this a tool for creating diagrams but ideal for brainstorming, mind mapping, and creating flow charts. Graphic Organizer Includes online and offline templates. three dozen graphic organizers for students. In this collection you will find PDFs for things like "Think, Pair, Share" and "Who, What, When, Where, Why" activities. You'll also find templates for designing a stories and interviews. Memofon Create mind maps from text. it is basically a text based mind mapping, learning and note taking tool. Wikibrains is a website designed to help you brainstorm in a web format. When you brainstorm on Wikibrains you're also performing a basic Internet search at the same time. To create a brainstorm web on Wikibrains start by entering one word or phrase. When you enter a word you will be prompted to add more words by completing the phrase, "Makes me think off..." Each new word or phrase that you enter will be added to your web. As you enter words on the right side of the screen you will see links to search results about each word. Free downloadable concept mapping program. More options than online graphic organizer tools. Even includes text boxes on links like Inspiration. Pinball is a suite of fun tools for organizing ideas and generating new ideas. In Pinball you will find tools for creating mindmaps, outlines, and simple slideshows. 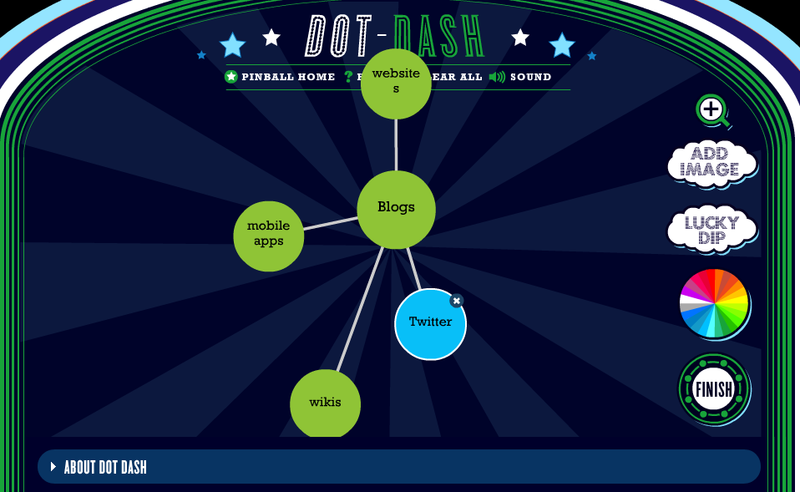 Pinball also has tools to help you brainstorm and generate new ideas. Each one of the six Pinball tools provides options for including text and images in your mindmaps, outlines, and slideshows. If you're struggling to think of new ideas, each Pinball tool has a "lucky dip" button that will serve up a random image or bit of text to prompt you. Mindmeister Create, manage, and share graphic organizers online and access them anytime from anywhere. In brainstorming mode you can simultaneously work on the same mindmap and see each other's changes as they happen. You can also use Skype to toss out new ideas and put them down at the same time. Diffen - What uses in the classroom might you find to compare anything? After-all comparing and contrasting is a 21stcentury skill which would come under Critical thinking. At first you will just want to play and see how it compares. I am sure you will want to put in apples and oranges, cats and dogs, and rain and snow. You may even want to practice a little political comparison. What content area items could your students compare? How about making a lesson. Check out these two additional digital tools that could come in handy from the people at Read Write Think as described in their own words. Compare & Contrast Map - This interactive graphic organizer helps students develop an outline for one of three types of comparison essays: whole-to-whole, similarities-to-differences, or point-to-point. A link in the introduction to the Comparison and Contrast Guide can give students the chance to get definitions and look at examples before they begin working. Unique and well developed organizers. Includes notetaking organizers, Literature Circle organizers, conflict resolution and many character development organizers. You can access a library of ready-made interactive thinking guides, print them, edit them or make your own. You can share them and work on them in groups too. A great tool that is simple to use and creates wonderful results. Allows people to communicate various sides of an idea. The underlying structuring of aMaps is based around "informal logic" - this is the logic people use to argue in everyday life. This can be applied to the classroom by using their site to create student debates on various topics. Students can map out the key literary elements of character, setting, conflict, and resolution as prewriting for their own fiction or as analysis of a text by another author in this secondary-level interactive. Searchable by subject area. These are templates not programs. I-Charts offer a planned framework for examining critical questions by integrating what is already known or thought about the topic with additional information found in several sources. On a given topic, students will have several questions to explore. These are found at the top of each individual column. Graphic organizers in Word make it simple to use without a special program.